Limited Print Editions Available. For inquiries, contact us. 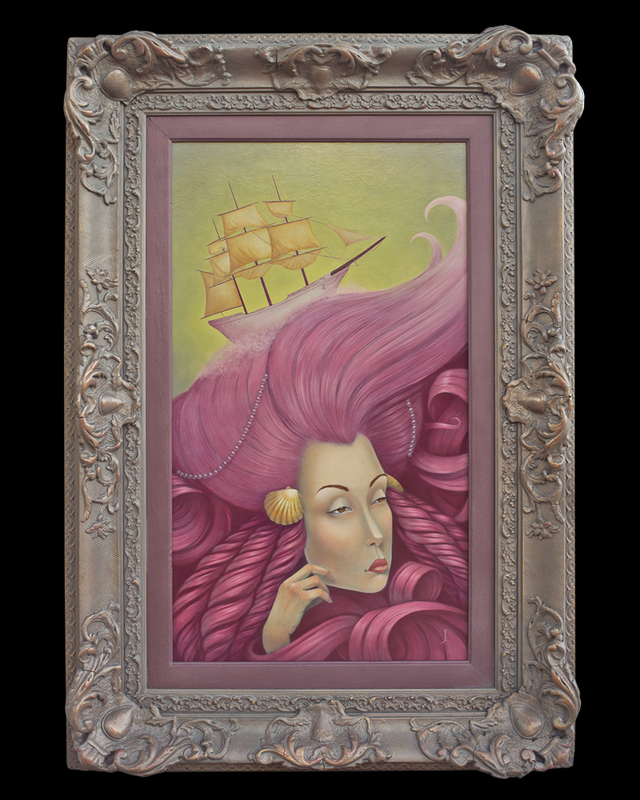 The Story: Waves of hair amidst an ominous sky, the queen watches over those who sail the deep blue sea. Though beautiful to look upon, beware of falling in love with her, for entanglement with her waves of beauty may drown even the most stalwart sailor. Spendlove uses a method inspired by the old masters called “Glazing” in all his oil paintings. It is considered a “Lost Art” technique and is used very rarely in the world of Art. This method has been self-taught through much research, as most of the old masters took their secrets to the grave. Using this “Glazing Technique” he paints many translucent layers of color over color to create realistic skin tones, vibrant colors and the depth you see in his paintings. The layers of oils capture the light in a way that is spectacular. The skin tones in his paintings are created using at least 30 layers of glaze and takes time between layers to thoroughly dry – most of his paintings take little over a year to create. Before painting, he searches for the most unique antique frames that suites his inspiration. Most of his frames are antiques and are sometimes modified with gold leafing and custom patinas to create a completely unified experience for connoisseur of fine arts.